Iowa “defunds” Planned Parenthood, causing four clinics serving thousands of patients to close. 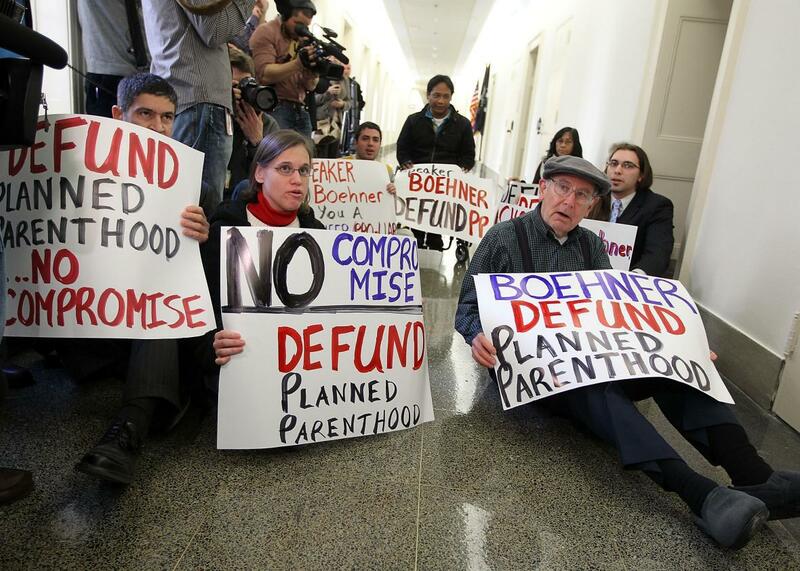 Anti-abortion activists protest outside former Rep. John Boehner’s office on February 23, 2011 in Washington, D.C. The Republican Party’s offensive on reproductive health struck a major win in Iowa on Thursday, when Planned Parenthood announced that it would close four of its 12 health centers in the state. The closures are the upshot of a recent appropriations bill the GOP-led state legislature and Republican Gov. Terry Branstad ushered through, rejecting $3 million in federal Medicaid funding for family-planning services just for the privilege of blocking family-planning dollars from going to facilities that provide abortion care. A federal “free choice of provider” Medicaid provision requires that states allow patients to use their Medicaid coverage at any qualified health-care provider, including clinics that focus on reproductive health. Iowa has now joined Texas and a few other states in turning down that free money to make a political statement about abortion. Facing a roughly $2 million funding cut, Planned Parenthood has decided to shutter health centers in Sioux City, Bettendorf, Burlington, and Keokuk on June 30. (The center in Bettendorf will maintain some telemedicine services until it can sell its building.) A Planned Parenthood spokeswoman told the Des Moines Register that the four clinics provided services to 14,676 unique patients over the past three years, and in three of the four counties that have Planned Parenthood clinics closing, those clinics covered 80 percent or more of their counties’ patients who got free or subsidized family-planning care in 2015. Without federal Medicaid money, Iowa plans to direct around $3.3 million of state funding to creating an independent family-planning program that will exclude facilities associated with abortion care. Cool idea! Texas already tried that, and the results were grim. Earlier this week, the state begged the Trump administration to let it get its federal Medicaid money back, because its replacement program was failing to meet previous benchmarks for women’s health coverage set before Texas slashed funding for Planned Parenthood locations. Back then, the state’s women’s health program had about 126,000 patients enrolled each month. Last year, that number was down to 79,000 patients. A large study found that, in the 18 months after Texas blocked federal Medicaid funds and stopped including clinics that provided abortions in its program, birth-control use plummeted and childbirth rose among Medicaid patients who could no longer get care from their counties’ Planned Parenthood affiliates. One day before Planned Parenthood made its announcement about clinic closures in Iowa, the Guttmacher Institute released an analysis that sheds light on just how vital Planned Parenthood is to affordable contraceptive access in the U.S. According to that analysis, in Iowa, federally qualified health care centers, which will be tasked with taking on the patients Planned Parenthood can no longer serve, would need to at least triple their load of contraceptive-services patients to account for all the new clients they’ll get. That is an impossible task, especially for a service like contraceptive care, in which any interruption in care can mean unplanned and unwanted pregnancies. There are currently 12,219 patients enrolled in Iowa’s family-planning program that takes federal funds. Analysts will be watching to see how many lose access to care on account of the GOP’s political posturing.